Weekly advertising newspaper free to the public. YOUR NUMBER 1 TRI-STATE SHOPPER serving 47 counties in Missouri, 9 counties in Illinois, and 1 county in Iowa. 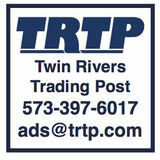 Check us out on Facebook at www.facebook.com/twinriverstradingpost!! * See TRTP info page inside the back cover of each edition for complete details on FREE classifieds.